Rhubarb is a leafy green that is related to buckwheat and is considered both a vegetable and a fruit in the U.S. The leaf is generally discarded because it often contains unsafe levels of oxalic acid, but the pink-colored petiole, or stalk, is traditionally cooked in sugar as a pie filling. The root of the plant, which contains emodin and other anthraquinones, is highly valued in Asian culture. Rhubarb root, referred to in China as da-huang, is harvested from mature plants that are between five and ten years old and is then carefully dried for use in making tinctures and extracts. Rheum palmatum is a member of the Polygonaceae family. Its rather large leaves are jagged and hand-shaped, and will grow to at least two to three feet wide. It can produce a jointed stalk as high as a six to ten feet, with loosely branched clusters of flowers along the tips. These mature to a red color from their often yellow or white blooms. The plant has rather thick, deep roots. 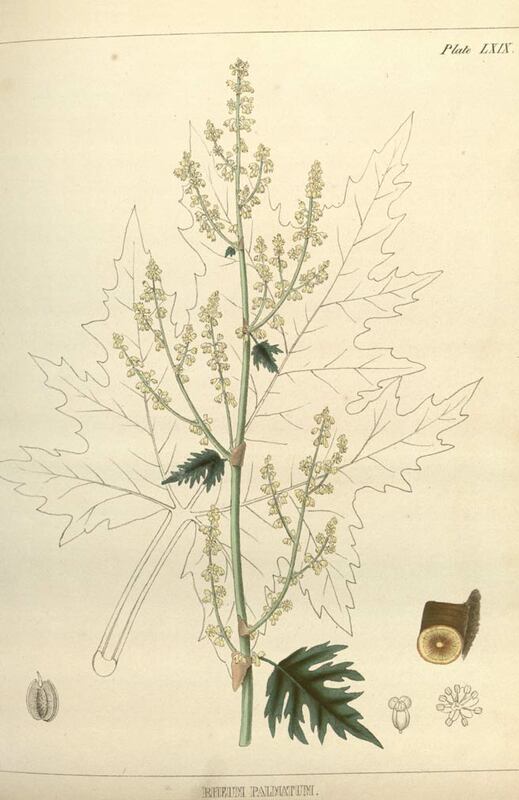 Rheum palmatum is native in the regions of western China, northern Tibet, and the Mongolian Plateau, cultivated widely in many parts of the world. Grows often in scrub, rocky places and by streams, 2500 - 4000 meters high. Can also grow on slopes and valleys at elevations of 1500 - 4400 meters in full to part sun. Sow seed in autumn in a shaded cold frame. The seed can also be sown in spring in a cold frame. When large enough to handle, transplant the seedlings out into individual pots and grow them on in the greenhouse or cold frame for their first winter, planting them out in the spring. Can also be divided in early spring or autumn. Divide up the rootstock with a sharp spade or knife, making sure that there is at least one growth bud on each division. Larger divisions can be planted out directly into their permanent garden locations. The roots are harvested in October from plants that are at least six years old, they are then dried for later use. Store dried rhubarb root pieces in an airtight container in a cool, dry place. The leaf is generally discarded because it often contains unsafe levels of oxalic acid. 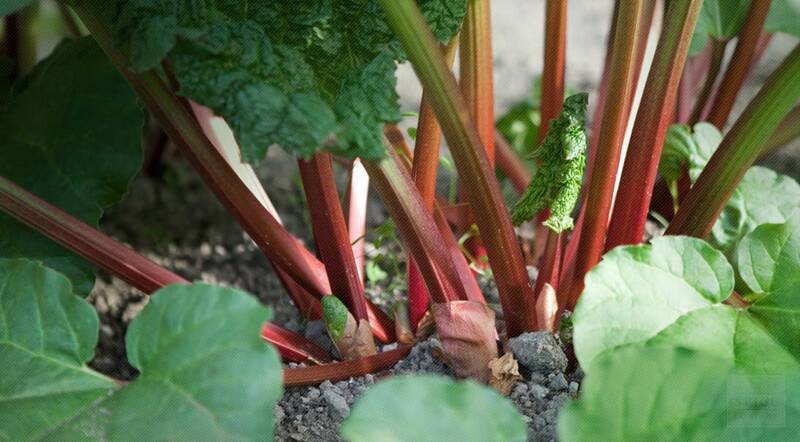 Medicinal rhubarb is a large, leafy perennial that reaches 10 feet. Its root is thick and branching, brown on the outside and yellow inside. Its stems are Nate in branching spikes of numerous small flowers. The medicinal species are not garden herbs. Garden rhubarb reaches only 3 feet. It has thick roots, reddish outside, yellow inside, and purple stems. Garden rhubarb is considered less potent in herbal healing. If you use it medicinally be prepared to adjust amounts upward. Garden rhubarb requires a dormant period in winter and does not do well in the south, where winters are warm. Sow seeds or root cuttings 4 feet apart in late spring in deeply dug, well-watered beds under full sun or partial shade. Add compost and mulch in winter. Harvest stems for pies the second year, roots the fourth.